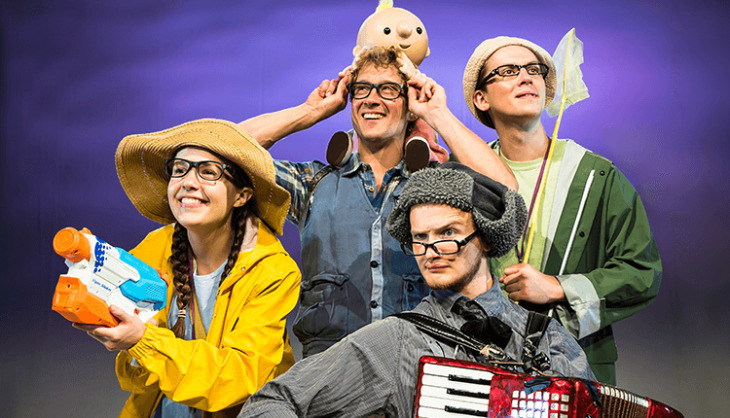 Direct from London’s West End, the smash-hit production of We’re Going on a Bear Hunt returns vividly and noisily to KidsFest! in director Sally Cookson’s fun-filled adaptation set to Benji Bower’s versatile lively score. Join our intrepid family of adventurers and their musical dog on a quest to find a bear; as they wade through the gigantic swishy swashy grass, the splishy splashy river and the thick oozy, squelchy mud! Expect catchy songs, interactive scenes, plenty of adventure and a few surprises along the way, the ending is not quite like the book! Performances for schools are available during weekday mornings. Please call Vanessa on 2547 7150 or email Vanessa.Lee@aba-productions.com for more information. BUY 3 tickets and GET 1 FREE for the performances on Friday January 11th, Saturday 12th 12pm. Be sure to select 4x seats when making an online booking and select the “Standard Buy 3 Get 1” price option. Please note that there will be no refund or partial refunds on discounts once tickets have been issued and paid for.